He’s also going back in time as he makes desserts for the new 189 by Dominique Ansel. Pastry legend Dominique Ansel’s first sit-down restaurant starts serving dinner in Los Angeles on Saturday, and there are all kinds of playful combinations and surprises on the menu. So at 189 by Dominique Ansel, the restaurant upstairs from the new Dominique Ansel Bakery in The Grove shopping center, Ansel and executive chef Hyun Lee are taking diners around the world. The chefs are riffing on Mexican elotes, Japanese chawanmushi, Spanish fideos, Korean galbi, Argentine churrasco and French rotisserie chicken. But at the same time, Ansel likes to serve familiar flavors in ultra-creative ways. At 189, the flavors of Mexican street corn show up in a sweet-corn milk bread served in a husk and topped with cotija cheese and Tajín. The simple elegance of Japanese egg custard is enhanced by some intense mise en place that involves cutting asparagus three different ways, including into tiny coins. 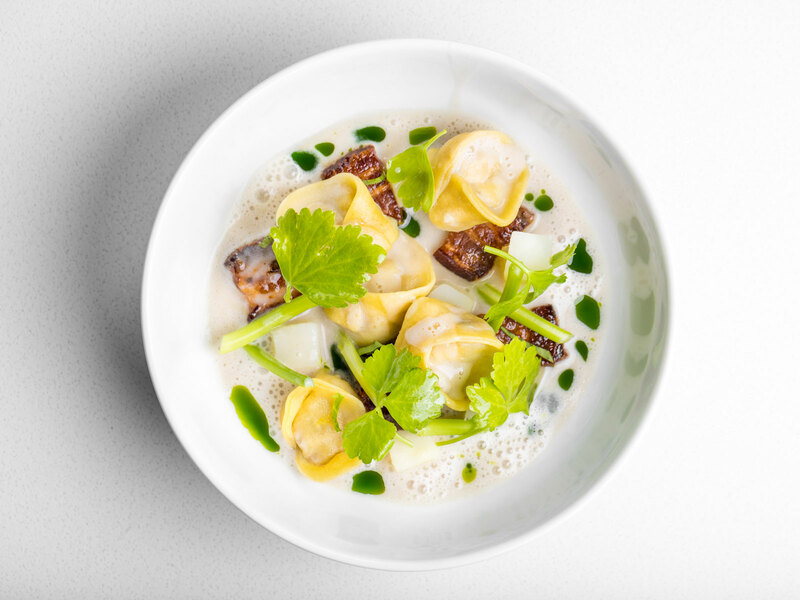 Ansel and Lee have reinvented clam chowder by putting littleneck clams inside tortellini and using a base of ajo blanco, a Spanish almond soup. So instead of shells at 189, you get clam-stuffed pasta alongside bacon in almond milk that’s emulsified with some clam juice. “It’s about taking something that’s usually heavy and making it lighter,” Ansel says. A fruit-marinated and grilled short rib has both Korean and Argentine influences. And then there’s the showstopping roast baby chicken that represents how Ansel and Lee ate as children and how food can connect cultures in beautiful ways. Ansel grew up near Paris, in a low-income family with a factory-worker father. Ansel, the baby of the family, shared his home with his parents, his brother, two sisters, his grandmother and a cousin. Money was tight and food was scarce, and Ansel has these vivid memories of going with his mother to the market for a rotisserie chicken. He and his mom would take the chicken home, rip open the bag and share the meat and all the drippings with six other family members. But on those special nights when he ate roast chicken as a child, things felt a little more luxurious than usual. Lee, meanwhile, ate a lot of samgyetang, a Korean soup made with a rice-stuffed chicken, growing up. So 189’s roast chicken comes with a black garlic rice stuffing and a shot of soul-warming jus alongside a scallion salad that resembles what you can find at some Korean restaurants. In a way, though, all of these savory dishes are just the preamble to what many guests are going to see as the main event at 189. More than perhaps any other restaurant in the entire world, diners are going to be saving room for dessert here. This is the first time Ansel is making plated desserts since the seven years he spent at Daniel in New York. Daniel got its third Michelin star and four New York Times stars while Ansel was the pastry chef there, but Ansel wants to create a different kind of dessert experience at 189. Ansel believe it’s important for the savory food and sweets at a restaurant to feel of a piece. “At some restaurants, the desserts don’t match the rest of the food,” he says. 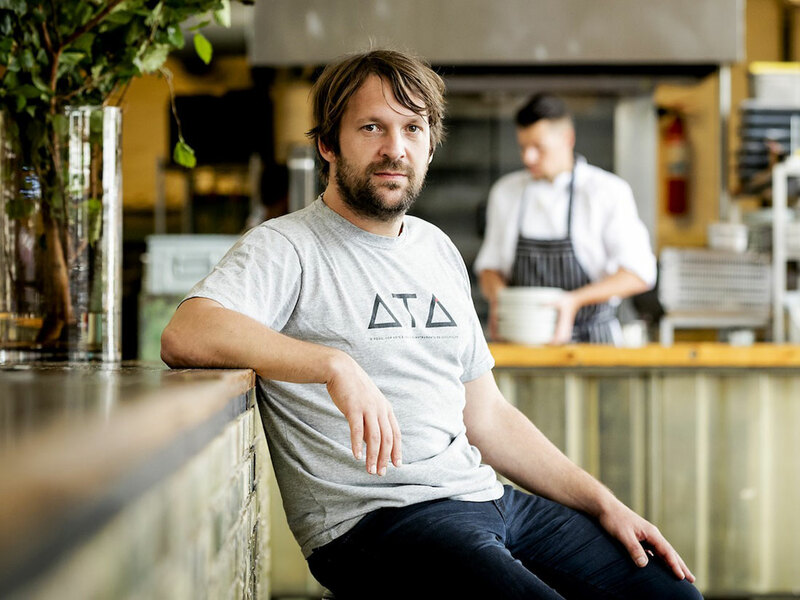 At 189, Ansel is serving five desserts that are based on his culinary training and formative food experiences. For the dessert known as The Well, Ansel turns milk granita, wildflower honey syrup, passion fruit gelée and fennel into what looks like flour, butter, sugar and eggs. 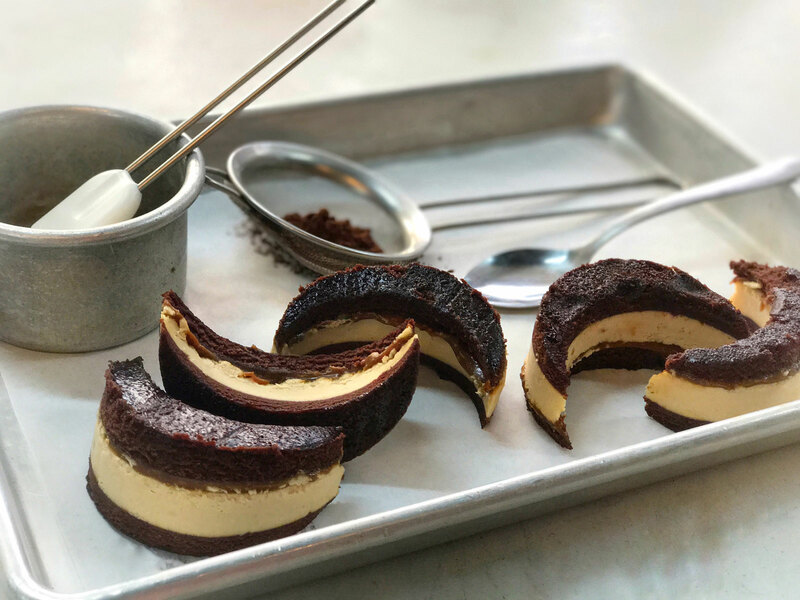 The dessert known as Trimmings makes the point that sometimes the best food at restaurants and bakeries is what nobody eats. So Ansel is making a dessert out of dark chocolate cake trimmings that guests can brush with dark rum syrup and dust with cocoa powder. The dessert known as Traditions is Ansel’s version of a tres leches cake (made with milk, evaporated milk and banana milk). 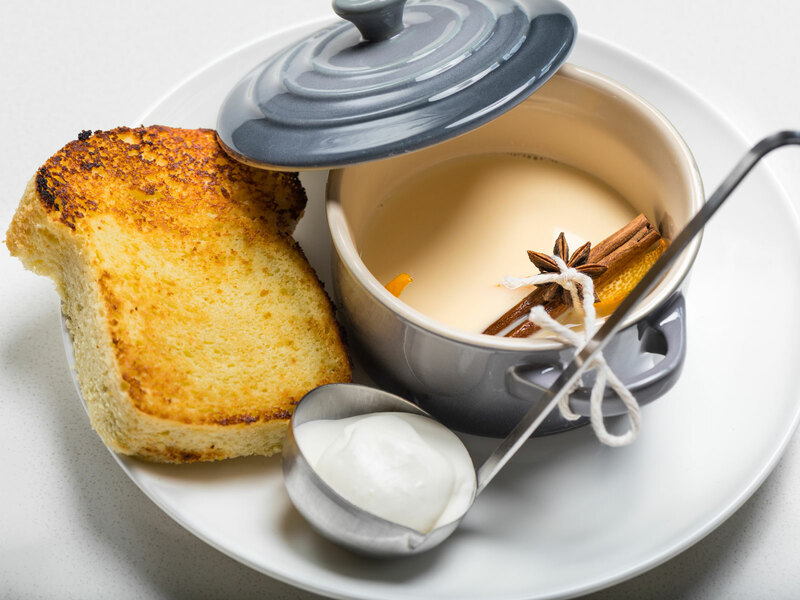 It’s based on the idea of using bread as a thickener for sauce and also the idea of putting bread into soup. What his grandfather was doing was extending the life of stale bread out of necessity. “Two or three generations ago, people were not wasteful,” says Ansel, who also remembers his grandmother soaking old bread in milk and re-baking it. So Traditions is an almond sponge cake that you rip up and soak in the warm milks before topping with a little crème fraîche. The dessert known as Knife Skills is apples five different ways. It’s one of those “simple” desserts that requires an almost sadistic amount of careful kitchen prep. Again, the mise en place at 189 is really something. The final dessert is known as Roast, which is a rarefied take on chestnuts roasting on an open fire. Speaking of dessert, we should point out that L.A.’s Dominique Ansel Bakery opened Friday morning with Ansel’s world-famous Cronuts. This is a crazy week for the chef. When we speak on Thursday morning, the reservations line for 189 keeps ringing and ringing. The bakery will likely be a madhouse with long lines for the foreseeable future. Ansel says he’s slept just five hours a night for three straight nights. He’s not complaining. He knows how far he’s come, from poverty to chef super-stardom (with bakeries in New York, Tokyo, London and now Los Angeles.) He's a man who has the resources to support hunger-relief charities; he raised more than $100,000 for charity by auctioning off 24 Cronuts in the first year of the hybrid pastry’s existence. Tune in LIVE now for a behind-the-scenes tour of our new LA home! Ansel remembers how people told him that he shouldn’t open a French bakery in New York, how they said he’d probably end up selling cupcakes and cheesecakes. He didn’t listen to people like that back then, and he’s not listening to people who think he’d be better off in L.A. if he just mimicked something like Balthazar. No, he has a vision and says he feels lucky to be in a city where he can execute it. And then the reservations line rings again.